Anchovies are a polarizing ingredient, and here in the United States the battle lines are typically drawn over their presence or absence atop a pizza. Occasionally skirmishes will also break out over whether anchovies belong in a Caesar salad; apparently not, at least in its original incarnation. But these fights are over are traditionally cured anchovies, which are a warm, lovely brick color when properly cured. These anchovies come in cans, soaked in olive or soy oil, or are sometimes packaged in little jars, encrusted with salt. They are, alas, the only sort of anchovies most North Americans ever see. 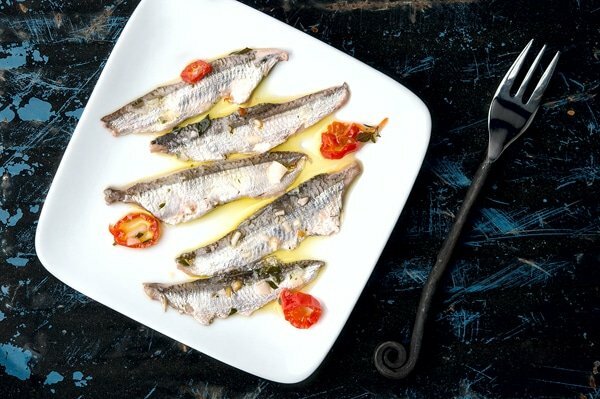 And while they can be good — really good in some cases — a far more delicate delight is the “fresh cured” anchovy, known in Spain as boquerones, in Greece as gavros, and often as “white anchovies” here in the United States. I was an adult when I first encountered boquerones, lined up like little sardines in a tub in the deli section of a glitzy market called Agata & Valentina on the Upper East Side of Manhattan, back in about 1995. They were labeled as “fresh white anchovies,” but they sure looked cured. I asked the woman behind the counter if I could taste one. Miraculously she said yes — there is a tradition in the New York metro area of people “sampling” their way through places like these, essentially eating their lunch for free. The fish was certainly not fresh. Eating one I got a big hit of lemon and vinegar, then salt, then garlic, then herbs. The anchovy itself was indeed white, “cooked” like a ceviche, firm and shockingly un-fishy. I mean yeah, you know you’re eating a fish, but regular anchovies can be so fishy-salty they’re off-putting. Not these. I bought a half pound, and my then-wife and I ate them at one sitting, on crackers with some white wine. A romantic moment in our short little marriage. Since then I eat them whenever I see them, and have made boquerones (bo-keh-ROAN-es), the name I see most often, at home several times. It is an easy process… if you can get fresh anchovies. There’s the rub. Anchovies spoil faster than any other fish I know of. Faster than herring, faster even than sardines. So getting fresh ones is a task, and is the biggest stopper for making boquerones at home. I have seen them in fish markets, sometimes at Whole Foods, sometimes at really good local markets, and sometimes at Asian markets. But honestly? The best way to get fresh anchovies is to find a bait shop near the Atlantic or Pacific Ocean. There’s one in San Francisco that supplies the fishing fleet in the Bay Area. This is where I got my anchovies. Not too long ago, I was fishing for California halibut with my friend Jay Lopes of Right Hook Sportfishing and we motored over to get some bait before we hit the bay. Halibut and stripers love nothing more than to eat live anchovies. It happened to be a slow day, although I did catch a decent striped bass. No halibut, though. But I did bring home the leftover bait, about five pounds of live anchovies, so I was more than happy. Besides, it’s just not possible to get anchovies fresher than this, and they were gorgeous. If you have to buy anchovies in a market, look at their bellies: Sardines, anchovies and related fish get what’s called “belly burn” rapidly after being caught. The enzymes in their guts start to dissolve the fish itself. This first manifests itself in broken bellies. The fish can still be OK to eat at this point, but they will not have much time left. 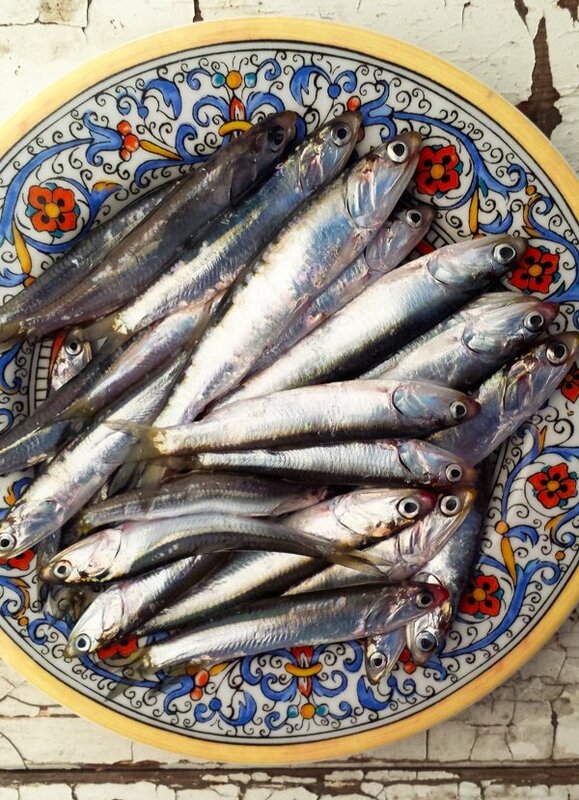 To make boquerones, you must clean your anchovies. This is a bit of a pain. Fortunately my friend Rosetta Costantino has a great video on cleaning anchovies, which I suggest you watch before starting. It will take about 45 minutes to clean a couple pounds of anchovies. You can cure them with their backbones left in, but they are not as easy to eat. Once cleaned, you salt the anchovies down for a few hours, then rinse and soak in lemon juice (Greeks seem to do this most often) or vinegar (the Spanish way). The salt draws out some moisture from the fish and firms them up, while the acid “cooks” the anchovies like a ceviche. To store, you layer them in a lidded container with garlic, chiles and herbs and cover them with olive oil. Kept in the fridge, they will keep for more than a month. It isn’t likely that they will last this long, however. White anchovies are addicting when eaten on crackers (I like Carr’s table water crackers the best for this.) either as a snack or as an appetizer course. I love them so much I tend to fish the San Francisco Bay not so much for the halibut or striped bass — don’t get me wrong, I want to catch them, too — as for the bait. Jay thinks I’m crazy. That’s OK. I hear that a lot. I have access to fresh anchovies, so I use them. You could however try this with sardines or pilchards or sprats or maybe even herring or smelt. I haven't attempted boquerones with these fish, however. Keep in mind that my ingredients are approximate: This is not an exacting recipe, and I typically do this by feel. You can also change up the seasonings if you want, too. Have fun with it! Keep the cleaned anchovies whole for now. You can pull the two little fillets apart when you are ready to serve your boquerones. Lay down the salt in a wide, lidded, non-reactive container; I use a tupperware. Lay down a layer of anchovies, then sprinkle salt over them. Repeat until you have all the anchovies in the container. Finish with the rest of the salt. Jiggle the container a bit to let things settle, then cover it and put it in the fridge for 3 hours. Remove the anchovies and rinse them quickly under cold water. Set them in another container like your first one. When they are all nicely rinsed, cover the fish with the vinegar or lemon juice. They need to be fully submerged, so use as much as you need. Cover and refrigerate overnight. The next morning, remove the anchovies from the vinegar. Toss the vinegar. Now find a final resting place for your anchovies, some lidded container that you can keep in the fridge for a few weeks. Pour a little olive oil into it, then line the container with a layer of anchovies. Sprinkle a little of your seasonings over that layer and repeat until you are done. The anchovies need to be completely covered in olive oil or they will spoil. You can eat them after a few hours, but they are better after a few days or even weeks. Mine have lasted 6 weeks before getting a little janky. Note that prep time does not include curing time. 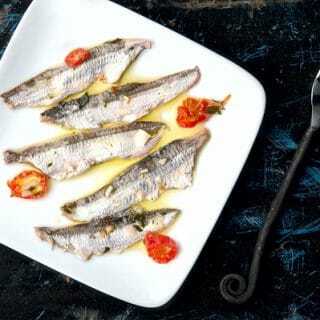 You can find a bunch of recipes for little fish like anchovies, sardines and smelt here on Hunter Angler Gardener Cook! I’m very excited to try this recipe. 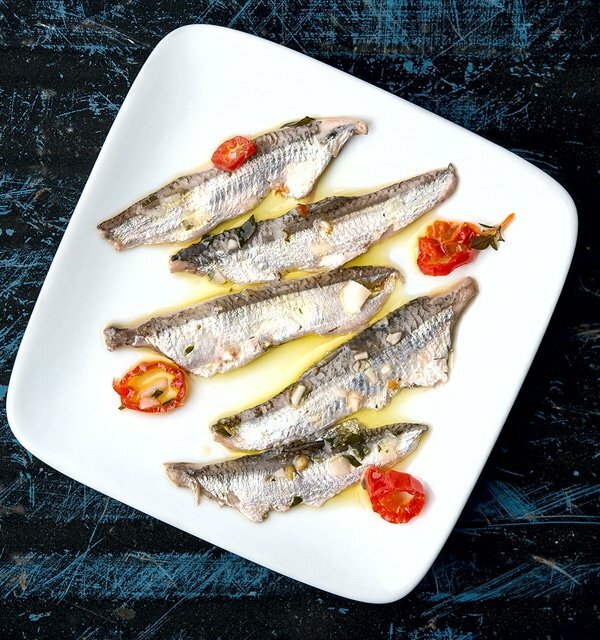 Question – I’ve read other boquerones recipes that call for freezing the anchovies to kill bacteria but notice that’s not called for in your recipe – is this because the salting / curing step sufficiently kills bacteria? Would freezing the anchovies affect their texture? Thanks! Teresa: I’ve never heard of anyone freezing anchovies. To my knowledge they are not parasitized. And yes, freezing them will turn the fish to mush. I wouldn’t do it.